Maryland Kitchen Remodeling Contractor | Kitchen Remodelers | Bradley Construction Inc.
Is your kitchen starting to feel old and outdated? Are you looking for more space to fit an expanding family? Call Bradley Construction! We have been remodeling kitchens throughout Maryland, Virginia, and Washington, DC since 1978 and we work with you to design and build a kitchen that your family will enjoy for years. Kitchen remodels are some of the most popular home improvement projects around, adding beauty, function, and value to your home—so don’t wait! Call Bradley Construction today at 301-253-6087. No kitchen remodeling project is too large or too small for the pros at Bradley Construction, so if you’re looking for a home improvement contractor to partner with, look no further! Simply put, we’re not happy until you’re happy. You won’t find a better team than the pros at Bradley Construction, so call us today! 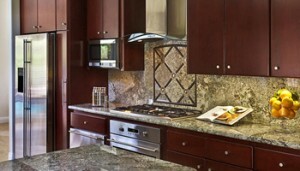 Why should you choose Bradley Construction for kitchen remodeling? Bradley Construction is one of the most trusted and sought-after companies in residential remodeling. Here are a few reasons why you should call on us when you’re ready to remodel your single family home, townhouse or luxury condo. Consider us your single source for quality, lasting remodeling design and construction services. From initial concept to final finishing touches on construction, we do it all with pride and a reputation for excellence built over 35 years in the remodeling business. We continually earn praise, repeat business and referrals from our clients. Our A+ rating and rave reviews speak volumes about Bradley Construction! See our numerous client testimonials to learn more. We don’t cut corners! When you trust us to complete your remodeling project you can expect well-trained, experienced and talented craftsmen who take pride in their work. Our materials are first rate and so is the attitude we bring to every job. Some people believe fair pricing means the cheapest price bid. Untrue! Fair pricing means the best work for the best price. If you are looking for a trustworthy, highly-skilled company that gets the job done right, then we are the right remodeling contractor for you. We promise to provide regular project status updates and will work hard to ensure the timely completion of every project phase. You’re never left in the dark when you hire Bradley Construction for home remodeling in Bethesda, MD! You deserve to know all the details of your remodeling project. At Bradley Construction, we are dedicated to providing all the critical information you need in an upfront, honest and easy-to-understand fashion. We freely answer all your important questions at every stage, and pricing is no exception. No job is ever considered complete until we’ve earned your seal of approval. It doesn’t get much clearer than that! Bradley Construction Inc. has successfully completed thousands of kitchen remodeling projects throughout the MD, DC and VA area. Our qualifications, attention to detail and high customer satisfaction rate give you peace of mind when you choose us for your project. Call us today to schedule an FREE initial consultation – 301-253-6087. Rockville, Potomac, Bethesda, Chevy Chase, Silver Spring, Washington DC, Gaithersburg, Germantown, Poolesville, Damascus, Frederick, New Market, Columbia and other communities within Montgomery County, Frederick County, Howard County, Carrol County, Arlington County and Fairfax County, VA.